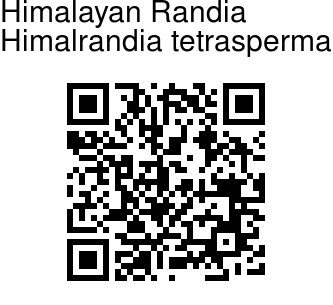 Himalayan Randia is a rigid, much branched, hairless shrub, growing up to 1.5 m or more. However, it is often found shorter because of goats browsing on it. Ovate-oblanceolate leaves are crowded at the end of branches. The leaves become narrow at the base, ending in a short stalk. Flower are white, tinged green, fragrant, solitary, stalkless. 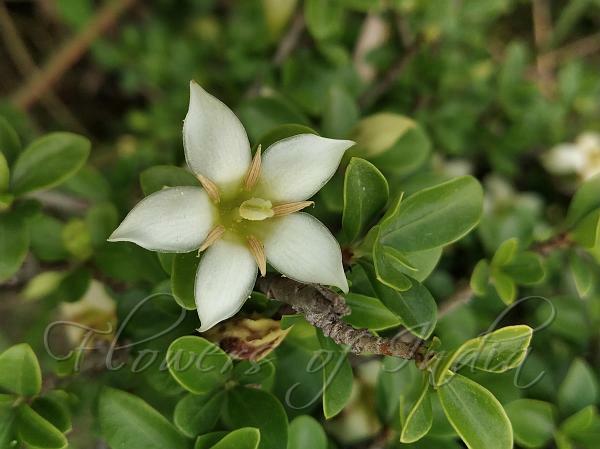 Flowers are 1 cm long, with 5 narrow-elliptic, long-pointed petals which are folded outwards. The stamens and the style protrude out. The fruit is a round blue berry.